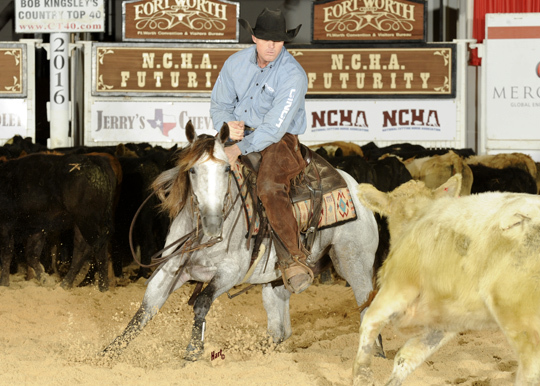 Two-time NCHA Futurity champion Craig Thompson and Metallicity took the lead Friday in the first round of the Open at the Jerry’s Chevrolet NCHA Futurity, presented by Great American Insurance, in Fort Worth. They marked 223 in the third set of the day to move ahead of a three-way tie for second at 221, shared by Sylver Dollar, The Golden Shot and BFR Call Me Catniss. Metallicity is by Metallic Cat out of Ms Silver Pitchfork, by Playgun. The 3-year-old mare was bred by Patrick and Laura Collins, who also bred and owned Thompson’s NCHA Futurity winners, Oh Cay Felix (2006) and Oh Miss Caroline (2011). She is owned by the Collins’ son, Quinn of Washington, Texas, and his wife, Caroline, who is Oh Miss Caroline’s namesake. Metallicity’s dam, Ms Silver Pitchfork, earned $12,000, and has produced Cotton Stakes champion and NCHA Derby finalist MC Simply Smooth. Ms Silver Pitchfork is a granddaughter of Sons Pitchfork, the mare Wayland Long rode to win the NCHA World Finals the year he was NCHA Non-Pro World Champion. Thompson, 46, is an NCHA Hall of Fame Rider, with career earnings of $2.3 million. He has qualified for the NCHA Futurity finals six times, and won twice. Friday’s new member of the 221 club, BFR Call Me Catniss, is bred and owned by Beechfork Ranch and ridden by Geoffrey Sheehan. The mare is by High Brow Cat out of SDP Finely Tuned. Sylver Dollar and The Golden Shot marked their 221s on the first day of competition.